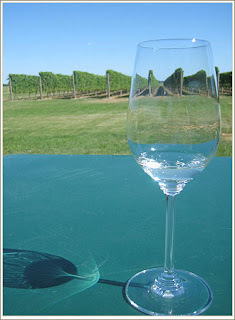 Good Wine Under $20: Summer in a Glass: the 2005 L'Ecole No. 41 Chenin Blanc "Walla Voila"
I was reading through your older posts and when I saw your reference to this blog, pabulum.ext212, in this article, I can't help sreaming "Gee, I know this person". The funny thing is that Cia and I currently work at the same company now. Welcome, Rouge and Blanc! I've got to get a link to you in the sidebar--great new blog. And Cia's a great photographer. The wine world is nice and small, and has some terrific people in it. See you again soon, over here or at RandB. My writing skills and wine knowledge still needs a lot of improvement but thanks for your kind words and encouragement.